Schwinn 270 Recumbent Bike is another beautiful piece from Schwinn, just as they have always been living up to expectation by producing quality and advanced machines. 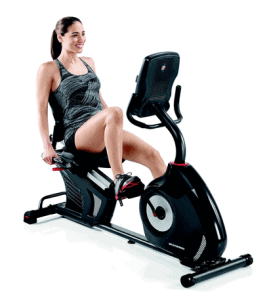 They really exhibited their trademark of outstanding creation with Schwinn 270 Recumbent Bike just as they did with the Schwinn 470 Elliptical Machine and many others. They are indeed specialists in health and fitness equipment. As you can see, Schwinn 270 Recumbent Bike is basically an advanced machine with features that are uncommon with other machines of its type. Did you know that Schwinn has been in the business of making bicycles for almost 150 years? Did you know they have been in the business of manufacturing exercise bikes for 50 of those years? These guys have got a reputation in this industry and undeniably great products to their name and to showcase. The features that accompany this machine are very advanced such that it has dual track LDC windows designed to monitor up to 13 different display feedbacks! It has 29 programs, out of which there is a goal tracking that will keep you challenged and motivated. How about the 25 levels of resistance available that allows a user to find his level of challenge and ultimately achieve positive results at the end. Then the recumbent vented seat ensures that its user is comfortable with a back support. There is nothing like being comfortable while working out because that alone will make you workout at your full potential. 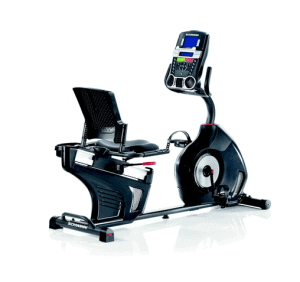 Schwinn 270 Recumbent Bike is now available on the Amazon with of course free shipping at a very reasonable price. 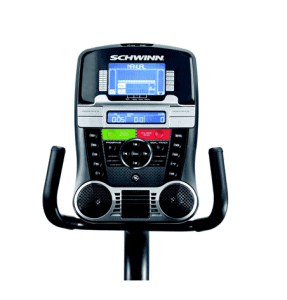 • Schwinn Connect goal tracking and data export update you about attaining your fitness goals. This is a bike that was well built and sturdy to support 300 pounds weight capacity. And users will not have to be worried about shaking and slipping that is very common experience with other bikes. The user only needs to get hold of the grip handles to monitor the heart rate and the seat is easy to adjust. For the fact this machine only weighs 87 pounds, moving it is not a problem as it comes with a transport wheel and handles. Here is my favorite, the dual track LCD windows, it is a beauty. This will display all the different data and information regarding your exercise, which includes distance, speed, resistance, calories burned, rpm, user profile, and much more. You can charge your electronic device using the USB port and also export data using Schwinn Connect technology. The seat has a back support with a padded bottom, which was designed to ensure comfortability of the user. And this is great especially for people that have back problem but want to exercise. As part of entertainment features, there are inbuilt speakers that would enable users to listen to their favorite music while working out. In addition to that, it has 3-speed fan that blows right on the user’s upper body which cools off the heat of the workout to an extent. A water bottle holder is designated at the convenient spot for easy access to water while exercising. It has a modest warranty; 10 years on frame, mechanics 2 years, electronics 1 year and labor 90 days. It can take between 1 to 2 hours to assemble. This is based on one person’s complaint amongst many positive reviews; he says that he found the seat uncomfortable and might not be good for someone with hip surgery. Another person complained about it not being too sturdy; it wobbles left and right when he was using it. The Schwinn 270 Recumbent Bike is a recumbent bike to consider given the fact that it has a very good Amazon customer reviews. It has almost 1000 Amazon customer reviews with an average approval rating of 4.3 out of 5. This is a very good indication that this recumbent bike worth considering because of it worth and value for the money you will be paying for it. Customer feedback has always been the best way to know which machine works. Over 80% of its users are satisfied with what they got and would recommend it. Currently, the price is way better than what it use to before and still retains its features and quality. It has a very good warranty and a very good number of features that would allow you to experience outstanding and effective workouts. Hi Nnamid. Great review. As a fitness freak myself although i do not have a bike machine in my home i do use bike machines regular in the gym. I do actually know this make but did not know they have been around for the last century and a half. Good education. well, i can say only one thing. I do love product, and I can say based on my experience cycling at home can help you lose a lot of weight. Of course following by healthy eating. And for people, like me, who doesn’t like running is a great solution. This would be a great addition to anyone’s home gym. It looks great and, from the sound of it, has some great features. Although it seems a bit high in price, when you look at what all it offers you have to wonder why they don’t charge more. Not that we want them too. Hello Michael, you have already said it is a bit high in price but after seeing the features you wonder why it does not cost more. However, I think it is still good at what it’s being sold at now, this will enable folks with intentions of acquiring one to get it. for doing cardio as for working out legs depending on what your need is. Also good to know that it isn’t too heavy to carry around. One question though , can you change the inclination and position of the seat? Hi thanks for this great review – I’m interested in building a home gym and would look at something like this along with adding some other machines. The price point looks good, but I’m wondering if you know if this model is available to people in the UK at all? Hello Mike, thanks for dropping by. If you are in UK you can use this link to place a purchase because it is available.